NEW YORK, USA -- Ukrainian heavyweight boxing champion Wladimir Klitschko says his trip to New York was not just about enjoying his first Super Bowl. 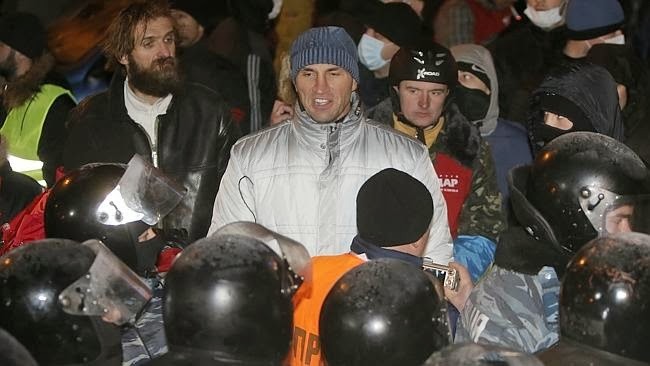 Heavyweight ... Boxing world champion Wladimir Klitschko (C), stands in front of riot police during clashes between cops and pro-European Union activists in Kiev, Ukraine. Foremost on his mind these days is bringing attention to the political crisis in the former Soviet republic. Klitschko, 37, follows in the footsteps of his older brother, Vitaly Klitschko, a former heavyweight champion who recently retired from boxing to concentrate on his duties as head of Ukraine's opposition pro-Western Udar party and on his 2015 presidential bid. "I just want to spread the word and say what is going on in the Ukraine and point out that we do have an issue that unfortunately could become a civil war, and much more people could die," Wladimir Klitschko told The Associated Press in an interview on Monday. "And we could lose another country, the Ukraine, to dictatorship." Since November, protesters have braved the coldest months of the year and refused to leave an encampment in downtown Kiev, the capital, or to vacate occupied buildings. So far, three have been killed in clashes with police. The trigger was President Viktor Yanukovych's failure last fall to reach a political and economic treaty with the 28-nation European Union, seeming instead to favor closer economic ties with Russia. Yanukovych then obtained a $15 billion aid package from Russia, further angering protesters who resent Russia's long dominance of their country. Russia had threatened Ukraine with trade consequences if the country signed the EU deal. A police crackdown fueled the protests, which grew more than 100,000 people. The only way out, said Klitschko, who will defend his WBA, IBF, WBO and IBO heavyweight titles against Australian challenger Alex Leapai in Oberhausen, Germany, on April 26, is for the government to resign and for early parliamentary elections to be held. "I'm worried for the safety of everybody, including my brother," Klitschko said. "This is not a joke. It's serious. It's about life and death." He added: "It's critical, and the situation can change in the blink of an eye." Leaders of the anti-government protests say they will seek constitutional changes that will weaken the president's powers. The changes are expected to be discussed in a Tuesday session of parliament. Protest leader Oleh Tyahnybok said Monday the opposition also will push for amnesty for more than 100 people arrested in the protests. Klitschko, who is engaged to American actress Hayden Panettiere, star of the TV series "Nashville," comfortably defeated Alexander Povetkin of Russia in Moscow last October, and is 61-3 with 52 knockouts. Vitaly Klitschko, 42, dubbed Dr. Ironfist for his prowess in the ring, scored 45 victories in 47 fights, 41 of them knockouts. He has successfully defended his title 11 times, most recently in September 2012. He entered politics for the first time during the country's 2004 Orange Revolution, the mass protests that led to the annulment of Yanukovych's fraud-tainted presidential win and ushered in a pro-Western government.